Fish were hard to come by this past week, let alone BIG fish! 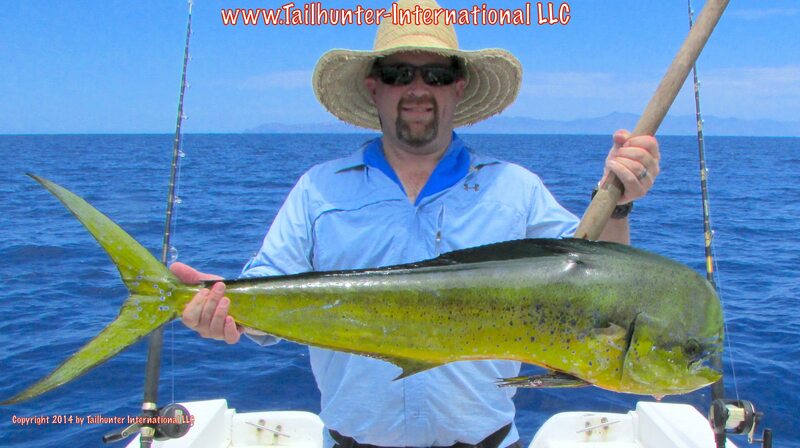 But Shawn Parker knocked in this big bull dorado fishing with our Tailhunter Las Arenas fleet. Great colors! 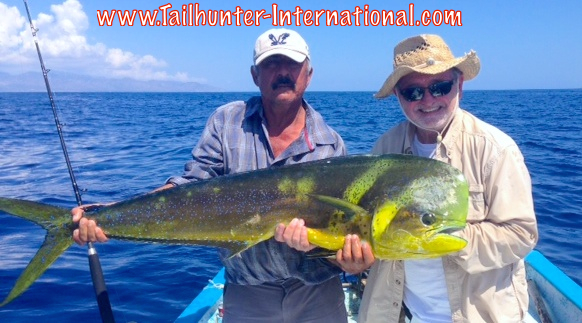 Big-headed bull dorado for Tony Perkins who gets a photo op hand from Captain Boli with our Tailhunter La Paz fleet. Check out the flat waters. Cerralvo Island in the distance. I love goof-ball candid shots. 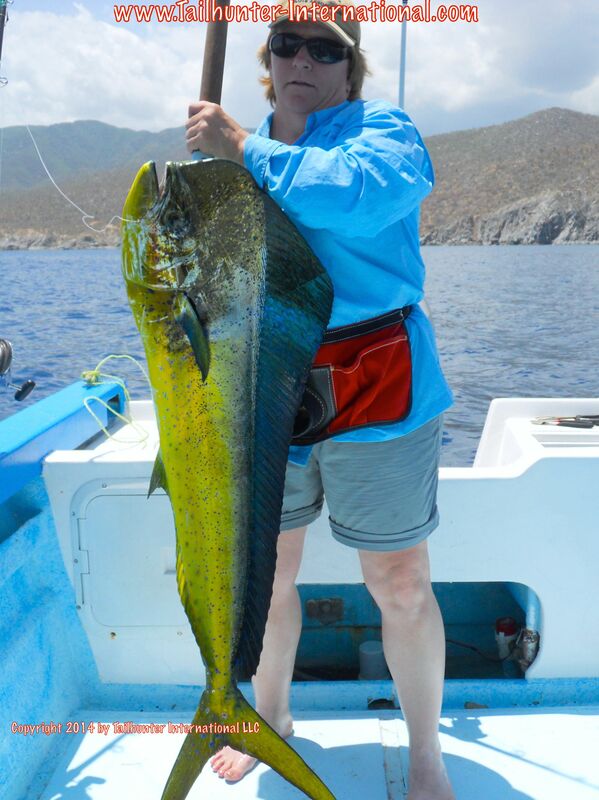 One of the best of the season is Captain Rogelio “Jolly Roger” Camacho who had the best week of any of our captains with stellar fishing 5 straight days with Leif Dover, our Atlanta GA amigo who visits us twice a year and shows off another big bull dorado. One of the funnest guys, but always takes serious fishing photos, Walt Topping from the Santa Ynez Valley got into the report with a nice bull while fishing with Captain Boli and our Tailhunter La Paz fleet. Johnny Gilbertson hung tough all week even during difficult fishing and kept at it hard! He did get this bull dorado just off Punta Arenas one of his days fishing with our Las Arenas fleet. It was a strange and not very good week on alot of levels here. It was hard to put a finger on it. Dare I say, it might have been the toughest week of fishing of the year…and maybe in many years of being down here! It was just STINKY for lack of a better word. Early in the week, it seemed we had threats of rainstorms just about every day. Some days it would actually rain pretty hard for awhile. Other days, we got nothing but clouds. But, it surely kept us on alert and trying to figure if it would be better for our fishing clients to fish out’ve La Paz or Las Arenas. 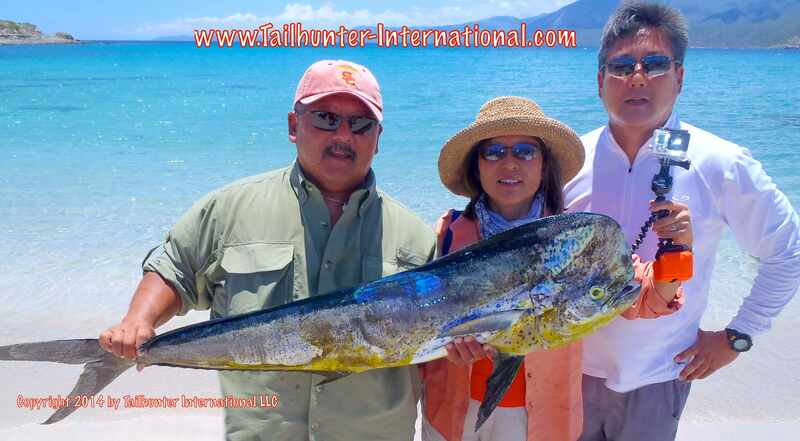 Mostly, just to be on the safe side, we kept folks fishing with our Tailhunter La Paz fleet. Dorado were more-or-less ready, willing and able and everyone was hooking fish. Not alot of big ones, but fun sized 10-20 pounders with occasional 25-30 pounders plus some billfish. When we did fish Las Arenas, there were rooster fish and enough 10 pound dorado to at least keep it interesting. Later in the week, it seemed that the weather pretty much cleared up. We were pretty excited after watching clouds for so many days! The conditions looked awesome. 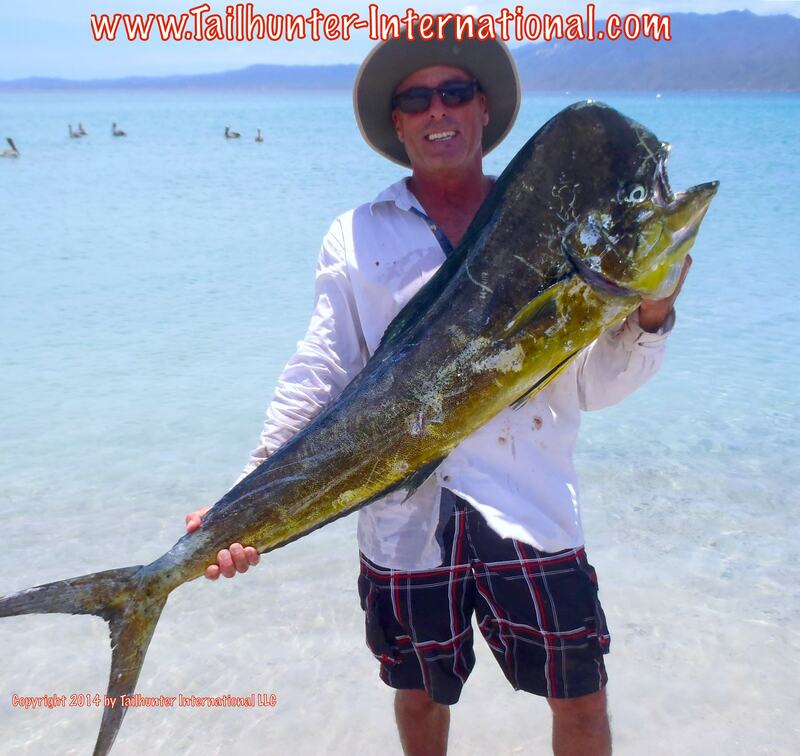 Sunny skies…dark moon…blue water…decent bait (at least more than we had before)…good currents…warm water…but WAIT! I don’t know what happened, but the latter part of the week it was almost like a dead ocean. Not only did the dorado go lock-jaw on us, but so did the bonito and even needlefish got scarce! Many of our ace captains who NEVER get shut out were coming back with nothing or only 1 or 2 fish. Maybe one day that can happen, but 2, 3, 4 days in a row? I don’t think I’ve ever seen that many days go dead on us. At least not that many consecutive days. Hopefully, but the time you’re reading this, things will have turned on again! Any day now! But we have to keep an eye out…MORE RAIN IS PREDICTED THIS WEEK! NO HURRICANES BUT THUNDERSHOWERS PREDICTED! Thanks to all the amigos who fished this week and kept the smiles. You’re all champs! Even when the fish weren’t biting, you kept at it and were all great sports! Yup! Still got roosters around! Leif Dover from Atlanta GA makes several trips a year with us and always gets into big fish. Captain Rogelio looks on as Leif hoists a big rooster estimated at 60-70 pounds taken on live bait. The fish was released. First billfish and it’s HUGE for Dr. Ed Mitoma who was fishing north of La Paz when he hooked into this unusually large striper estimated at 170-200 pounds by Captain Alfredo. Quite a few billfish were hooked this past week. 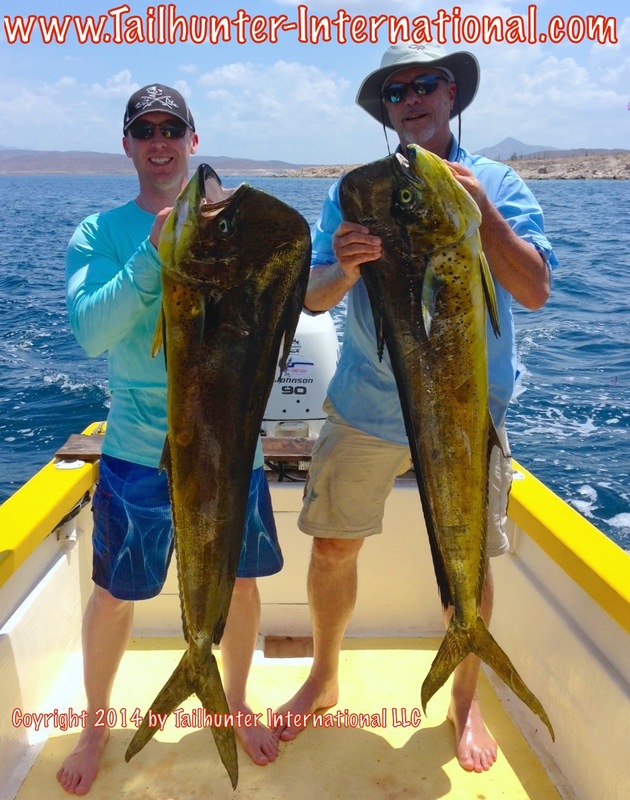 Two of the larger dorado taken this week among so many larger fish that were lost! That’s why they are bigger fish! But George Kasee and Leif Dover pose with two big bulls. From Texas, Kevin Todd was fishing out’ve Las Arenas and got this unusual rainbow runner which is a cousin to yellowtail and makes great eating. Kevin couldn’t resist the photo with the cigar in the fish! Great shot! Coach Joey Fuschetti insists his ability to catch fish has something to do with his camouflage shirt so the fish can’t see him! He always does well fishing with us every year! 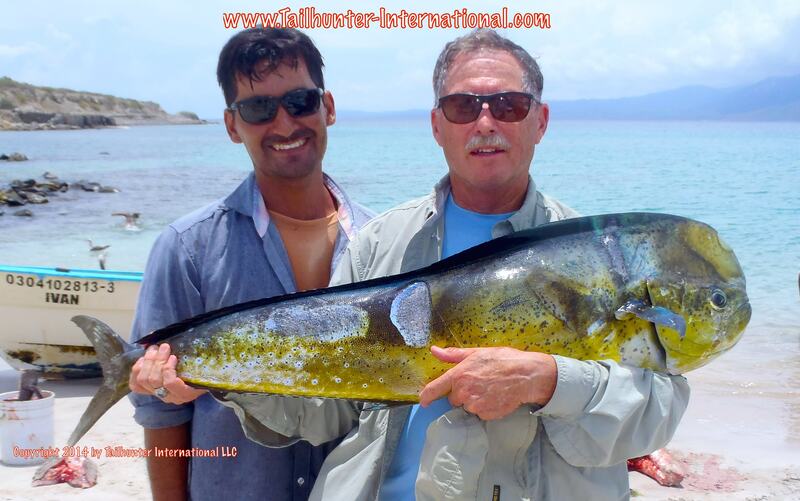 Captain Jorge and George Kasee with another rooster caught and released off Las Arenas! We spent the week dodging the “possibility” of thundershowers all week and it looks like as you read this, we’ll be doing the same thing this week as well. According to predictions, we ran anywhere from 10-80% chance of thundershowers all week. Now, that didn’t always mean it actually dropped water on our heads. Some of these never ever materialized other than some big fluffy clouds. Sometimes they were little squalls. On two days we had real gully washers and floods that lasted about an hour…then the sun came out. Sometimes it rained in one part of the city but a few blocks away, they got nothing. It really didn’t affect our fishing much other than we kept most of our anglers fishing with our La Paz fleet instead of taking the chance of fishing with our Las Arenas fleet which has areas that are much more exposed to wind and waves. Especially the wind! A little rain is no biggie but big winds…you might as well forget it. As a matter of fact, the only day when fishing was really off was a day that south winds kicked up into double digits. For the most part, however, even if the rains came, it was generally in the later afternoon after all the fishing was done. That’s what it looks like again this week as several big storms hundreds of miles to the south of the Baja keep passing by out to sea, but spinning bits of rain cells our way. Because of the threat of thundershowers, we didn’t do much fishing in the area. It was just easier to keep fishing out’ve La Paz instead where the anglers had a better shot at good weather and more chances to get into fish, even if the weather late in the day soured. However, when we did fish, the fishing was OK. We got into some TUNA! Yes…there were some big boy tuna that showed up. Several guys hooked into tuna estimated over 100 pounds, but all the fish broke off without ever seeing the fish. The area was around the south point of Cerralvo Island. 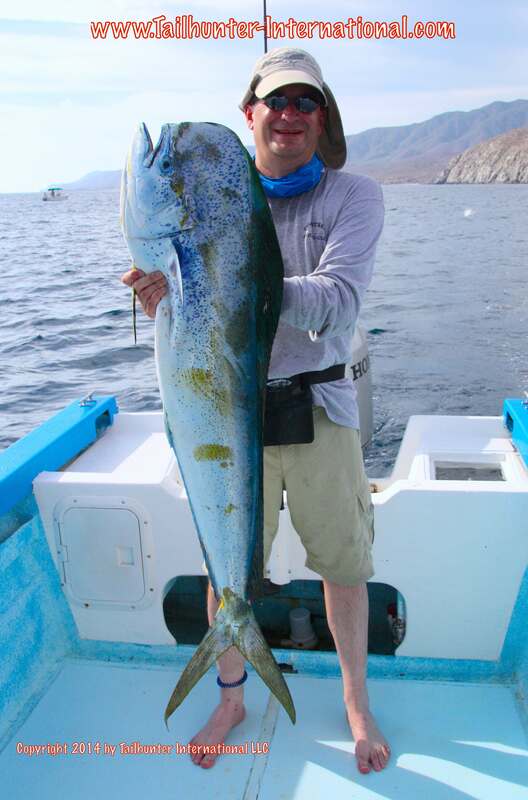 As for other species, the fun-sized 10-15 pound dorado were usually pretty easy to catch as well as big bonito. 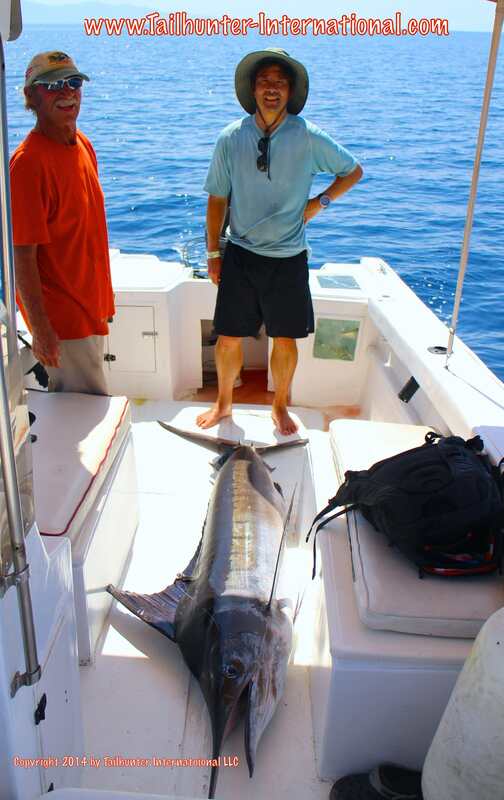 But the nice surprise were the number of hookups on sailfish and striped marlin. Most fish either got loose or were broken off. We also got several nice rooster fish along the beach in the 20-40 pound class. As mentioned above, this was our most consistent area to fish. It was better to fish here than take a chance and end up in stormy weather further south. And, for the most part, it was a good decision. Decent to very good dorado action took center stage. Lots of fish were lost so the counts weren’t as good as they could have been, but pangas still averaged some good counts of 5-20 pound fish with some larger in the 30 pound class. Every day was different. Every panga was different. Some areas produced wide-open bites one day, but the same spot the next produced very little. But if one spot wasn’t working, other spots took over. Some nice rooster fish were caught and I was surprised at the size of some of the striped and blue marlin hooked and lost! 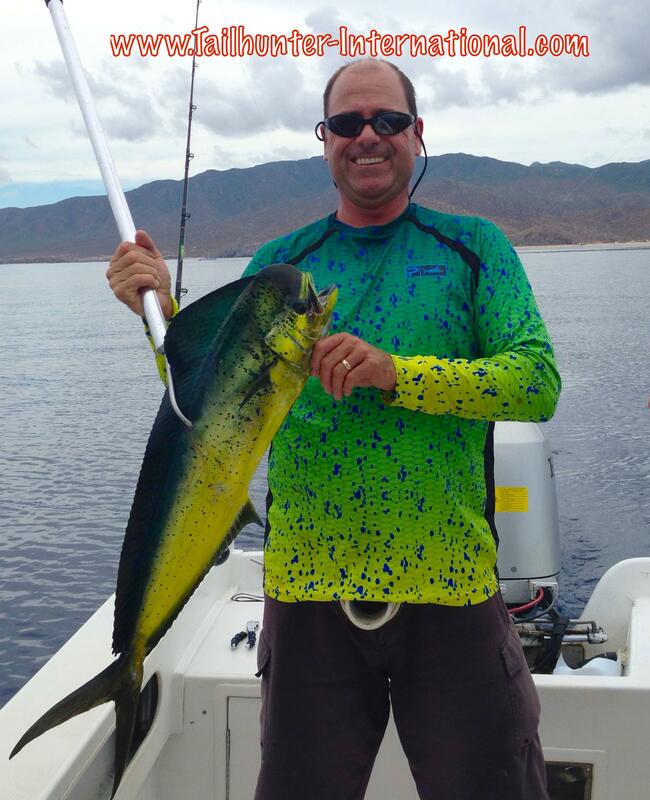 Another pretty solid week of dorado fishing with some really nice bulls taken including this sweet one that jumped a bait and bent Steve Dorsey’s rod fishing north of La Paz. Captain Adolfo poses with our Colorado amigo, Frank Kunze who fished with us all week and had a good shot of dorado including this nice bull he got on the flyrod after just missing a rooster on the fly. He’s on the beach here at Bahia de los Muertos. Ed Sakuda was on his first visit to fish Las Arenas and we think he’s “sold” on coming back with 3 days of dorado fishing. His sister Caryn and her husband Mark Aizawa from Pasadena CA get in the photo too! Daniel Llerena from Buena Park had never fished salt water before and his dad hadn’t fished in salt water in more than a decade! The two of them came down and got in two quick days of fishing with some great results! 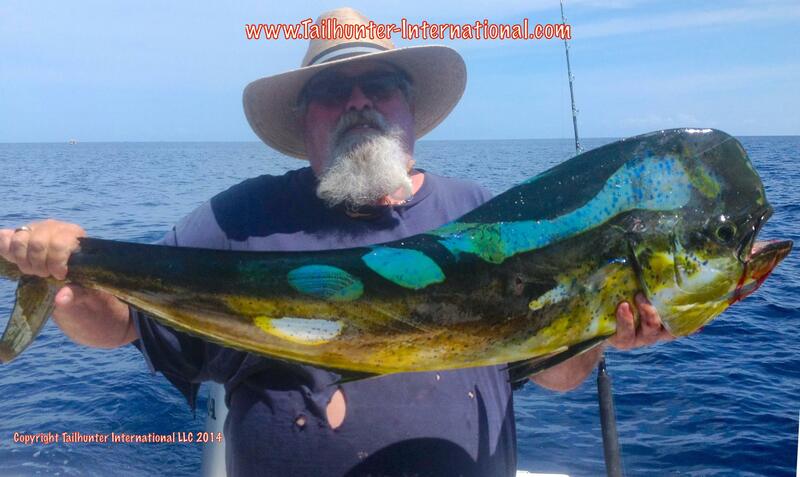 Dan was fishing with Captain Joel when he put the hurt on this mahi. 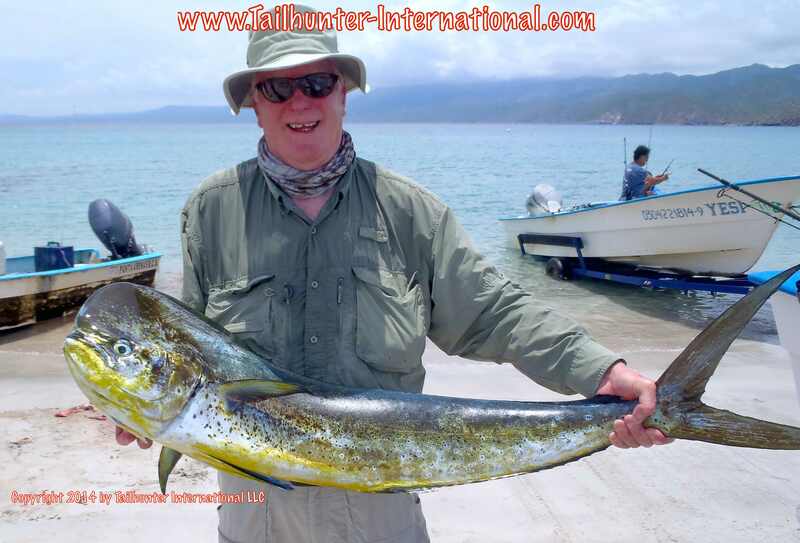 Lee Carlson from the Denver Colorado area, spent 6 days on the water with us fishing with both our Tailhunter fleets and shows off one of his better bull dorado he got near Cerralvo Island. Dan Hayler and his family all got together on one of our mega pangas for a day of fishing on the bay and had a nice day of action. The family is from Upland CA. Gino and his son Daniel Llerena got in two quick days of fishing and made the most of it with some nice dorado as well as this striped marlin on light tackle. Cerralvo Island in the background. Kelly Soo Hoo has fished with us before and did really well. This time she brought her son, Nick, for his first experience. Nice had a great time and got a variety of fish including these very tough jack crevalle! From Bankor, Pennsylvania, Rich Normyl had a full hand of mahi. Check out the storm clouds coming up behind him at Bahia de los Muertos! The whale sharks have returned to La Paz bay. 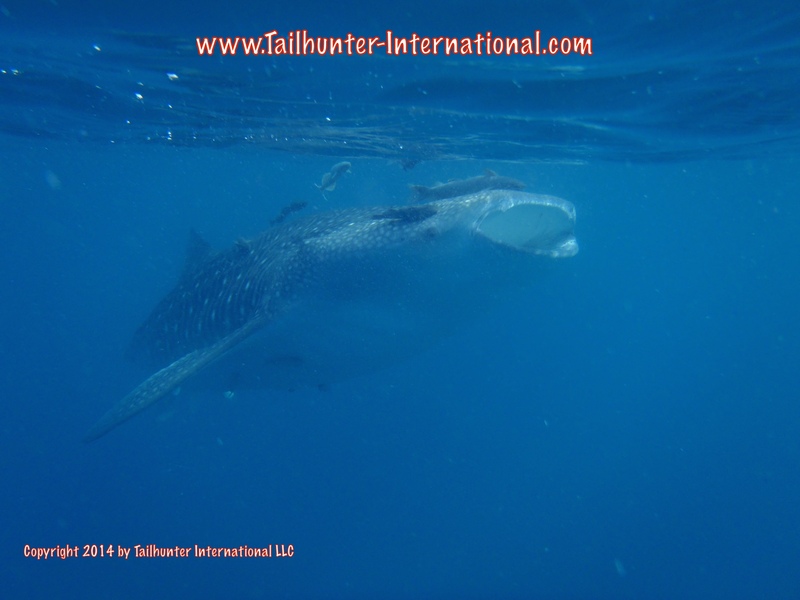 Dan Hayler took this great photo of a “baby” whaleshark of only about 20 feet in the shallow bay water. They can grow to over 50 feet long and are true sharks, but are gentle and have no teeth and eat plankton. This is what 15 minutes of rain produces on the La Paz waterfront right in front of our Tailhunter Restaurant Bar. Even with the week of “super moon” we still had a pretty decent week of fishing going on. Even with the tropical thundershowers late in the week that were almost like baby hurricanes, the fish still bit. But it was a bit of a challenge. But, like I said, the fish still bit. The super moon was beautiful over Baja waters, especially here in La Paz over the bay making it much like a postcard with the huge bright moon shimmering over the bay and the palm trees. The big problem was more of these afternoon thunderstorms that crashed into us late in the day. Fortunately, mostly after the fishing was done. But something to watch. Blue skies would darken quickly. Incredible lightning storms would follow then almost simultaneously thunderclaps that would sound like they were right overhead. During one 2 hour period during one storm, over 70 light night strikes were counted. During another storm, a bolt hit a palm tree on the malecon waterfront area igniting it which then caused it to fall on the palapa roof of a popular bar. The bar caught on fire then burned to the ground with huge flames 30 feet in the air. Within minutes of the thunder and lightning the rains would cascade. Huge rolling waves of sheer water flooded streets and turned many into rivers and lower areas and arroyos into raging category 2 or 3 cauldrons that would’ve been the envy of whitewater kayakers…except they were all brown mud! Cars suddenly found themselves up to the doors in water and many stalled. Neighborhoods found themselves turned into islands with people trapped in long rainy lines unable to leave the area and others in the opposite directions unable to return home. Off the La Paz cliffs, mini-Yosemite-like waterfalls tumbled 20, 30 40 feet to the roads along with rocks and boulders. In a one hour period during one storm, more than 3 inches of water descended on La Paz. But, like I said as far as fishing, at least most of this was all taking place later in the day or evenings when the fishing was done. There was only one day during the week when we decided it wasn’t worth it to fish Las Arenas because of the stormy conditions. The rest of the time, for the most part, Las Arenas was pretty much as good as it has been all year. Relatively speaking. We actually even had small sardines to use for bait and we had flyfishers hooking rooster fish, dorado, jack crevalle and bonito. The dorado were 5-15 pounders with a few 20-30 pounders as well. If a boat found the right spot, limits were pretty easy. 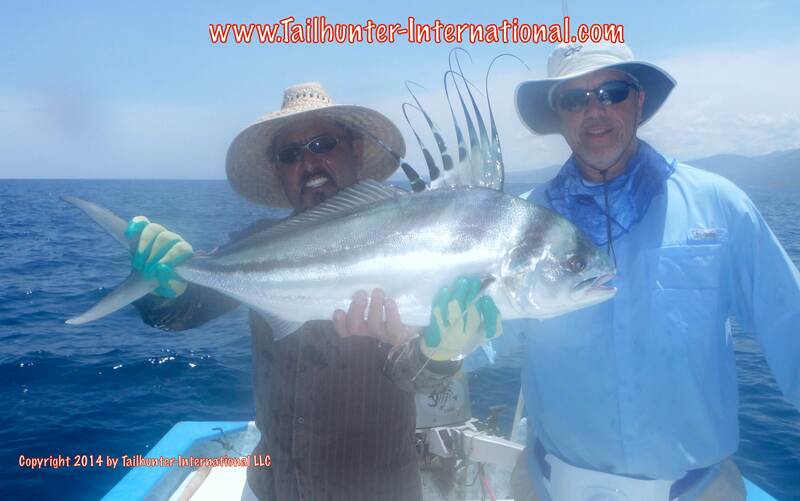 Roosterfish, while not as plentiful as earlier in the season were still around with most in the 10-30 pound class. Bonito, jack crevalle and even some barred pargo gave us some variety. 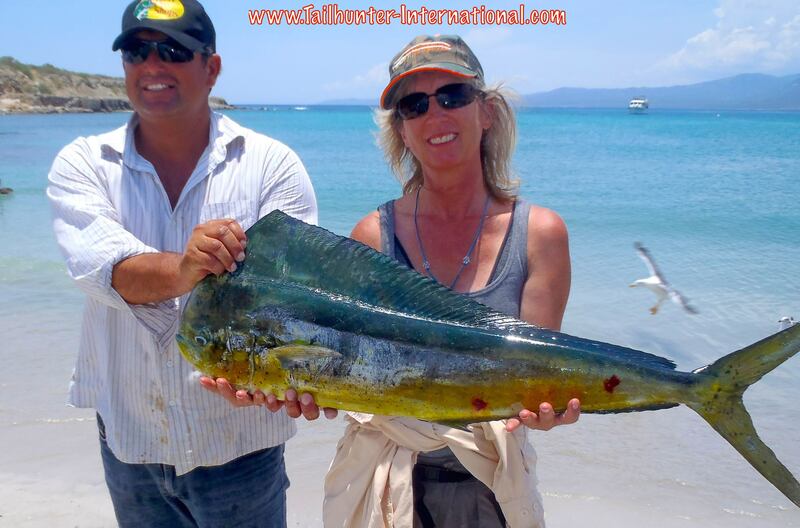 That was usually made up for on the other days of fishing when the dorado would be found in many areas from just inside the bait to the island and then around the point to El Rosario and Las Cruces. Generally, the fish were 10-15 pounders although there were still persistent squirts in the 5 pound class around. But, larger 20-30 pounders were not uncommon. We also hooked some marlin and sailfish with most being released as well as some stray rooster fish that ran about 30 pounds near Espirito Santo Island. 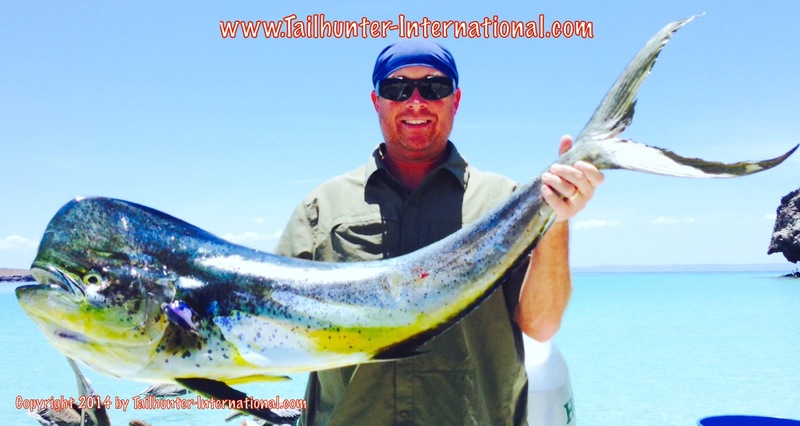 First-time visitor to La Paz with Tailhunters, Jack Calafato from San Diego got one of the larger dorado of the week scoring with this nice bull on his first day of fishing while on the water near Bahia de los Muertos. Our good friend for many years, Bob Lederer, from Massachusetts with Captain Ramiro and a trophy bull dorado taken at Las Arenas. Somewhere behind this fat round roosterfish is Rich Normyle from Bangor, Pennsylvania. His first bait hit the water and got spanked by the big fish and took 20 minutes to get to the boat. It was photo’d and released. 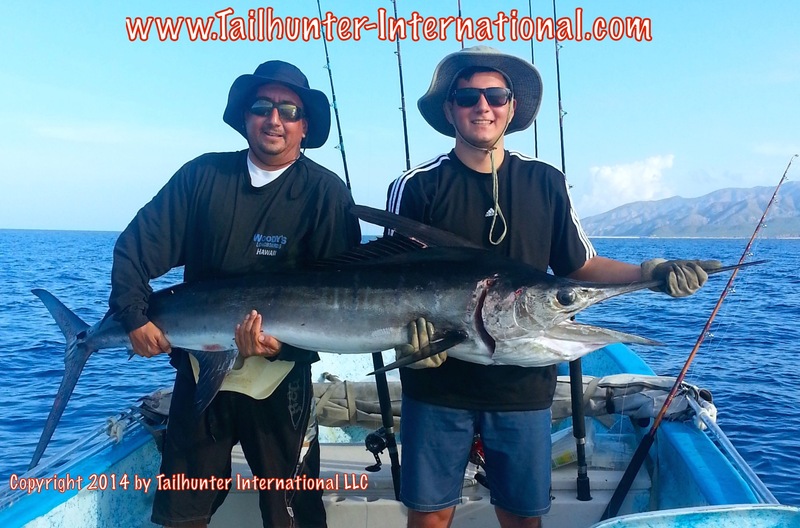 Captain Raul with the Tailhunter La Paz fleet looks on and “helps” with the tail! Captain Pancho is all smiles with our Oregon amiga, Mitch Bohna, and her dorado she hooked very close to the beach off Boca de Alamo. Not a bad start to several days of fishing. 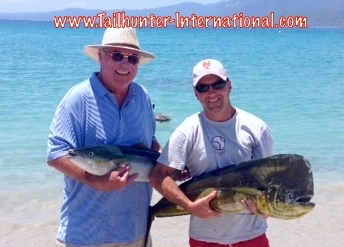 Dennis Adair from N. California and Doug Oclassen from Colorado pose with a nice bunch of mahi on the sand. 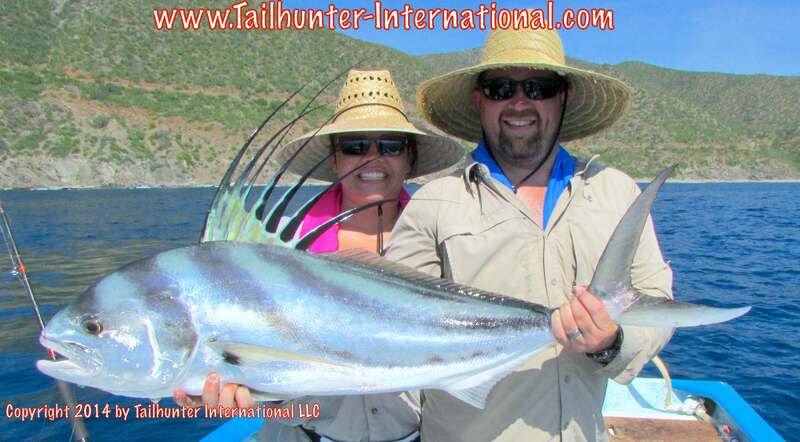 Big smiles from Kris Brownlee who gets a hand from husband, Luke, with this fine roosterfish that chased a live ladyfish between Boca de Alamo and Bahia de Los Muertos justt off the rocks. They caught and released several nice fish. They’re from Rock Springs, Wyoming. 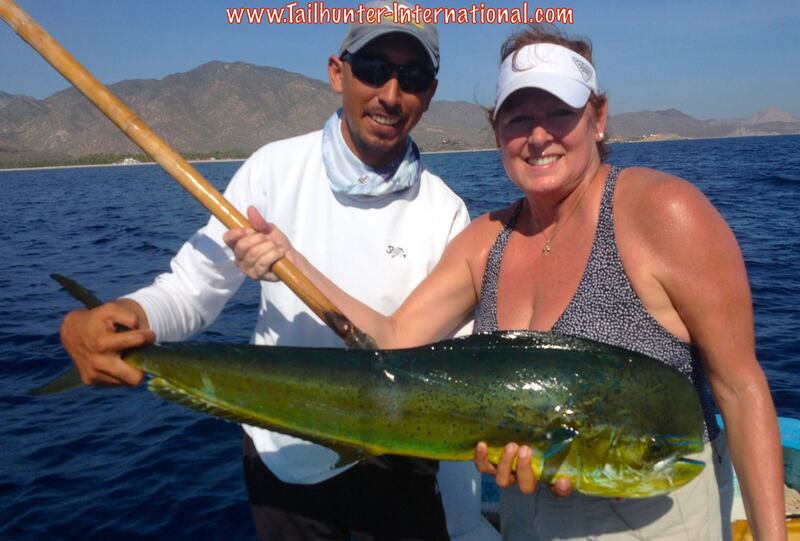 Captain Armando poses with our amiga, Shelley McDonell on the sand with a nice bull dorado that still has its colors. Shelley and Captain Armando always make a good team every year. The ladies had a good week! 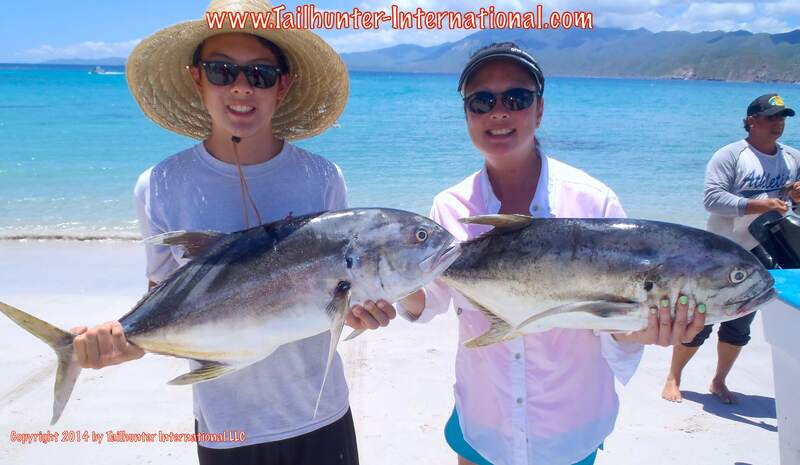 Captain Jorge and Patty Lovato from the Denver, Colorado area on her first trip to fish with us in La Paz. OC in the house! 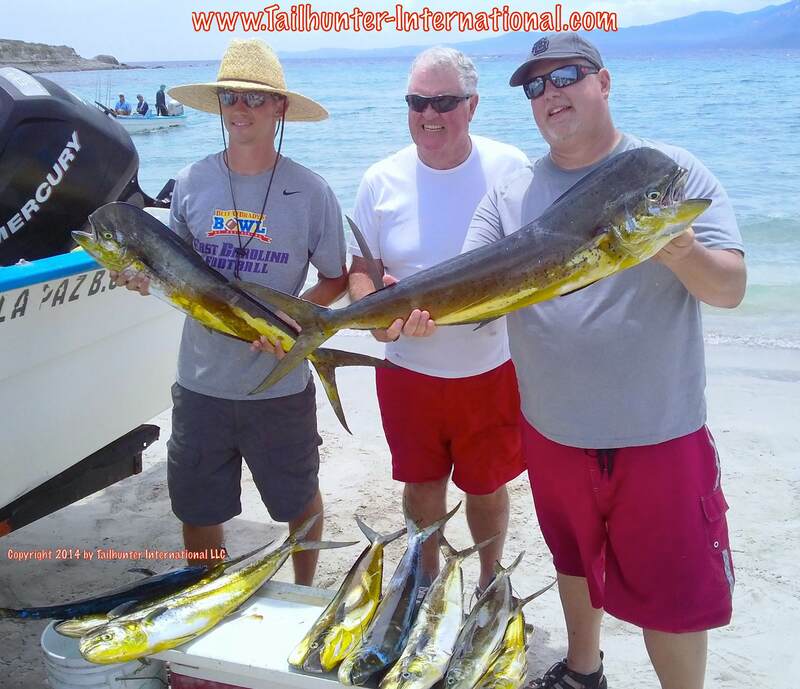 From S. California, Brendan Rowland, Dr. Mark Mulkerin and Ed Begany spent a few days fishing with us at Tailhunter and got into some good action with 2 days fishing at Las Arenas. Dennie Dyer and Matt Lederer were just fishing with us and insist they got a yellowtail! Take a look. It’s hard to tell from the photo, but Dennie does seem to be holding a yellowtail…a fish we only catch in the colder waters! It might be a rainbow runner (yellowtail cousin), but hard to tell. 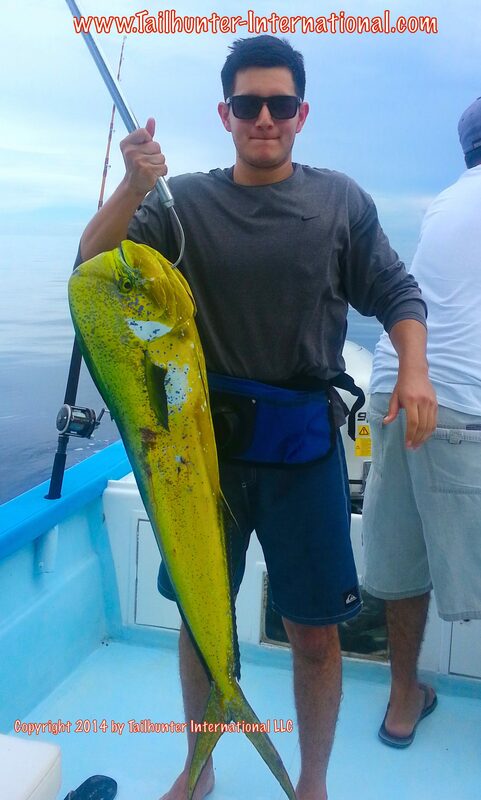 Still a nice catch and tasty too…with the dorado! DORADO KICK IT IN AT LAS ARENAS FINALLY ! 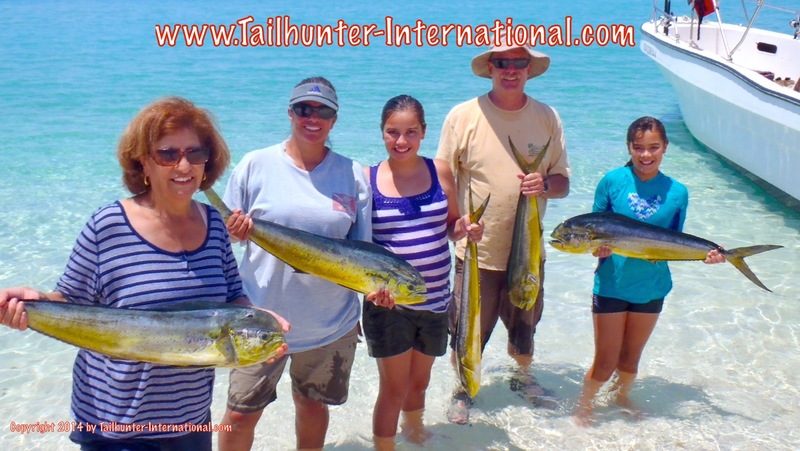 Once again, dorado really kept up the for both our Tailhunter fleets this past week. Weather and water were fairly cooperative and threats of rain, while bringing some clouds, never materialized and, instead helped keep the heat away, although the humidity was still pretty thick. All-in-all, a pretty good week of action! Over the past few weeks, this has been our tougher spot. There have been fish there all year, but lots of small fish and not a whole lot else. It if weren’t for the rooster fish there or the fortuitous marlin or sailfish plus jack crevalle and bonito, it would be a real yawner. Don’t get me wrong. Still good fishing! But, historically, this time of year, Las Arenas should be on fire instead of a steady smolder. But, we’ve been spoiled all these years. The lack of bait hasn’t helped. 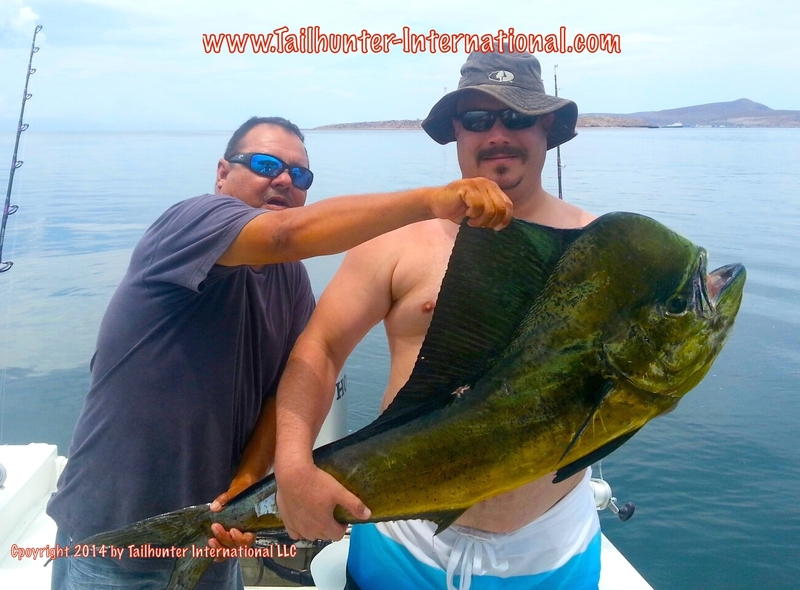 Many of or clients have switched to our other fleet at La Paz to get not only more fish, but bigger fish! Not so, this past week. We actually had the migration of clients doing just the opposite! 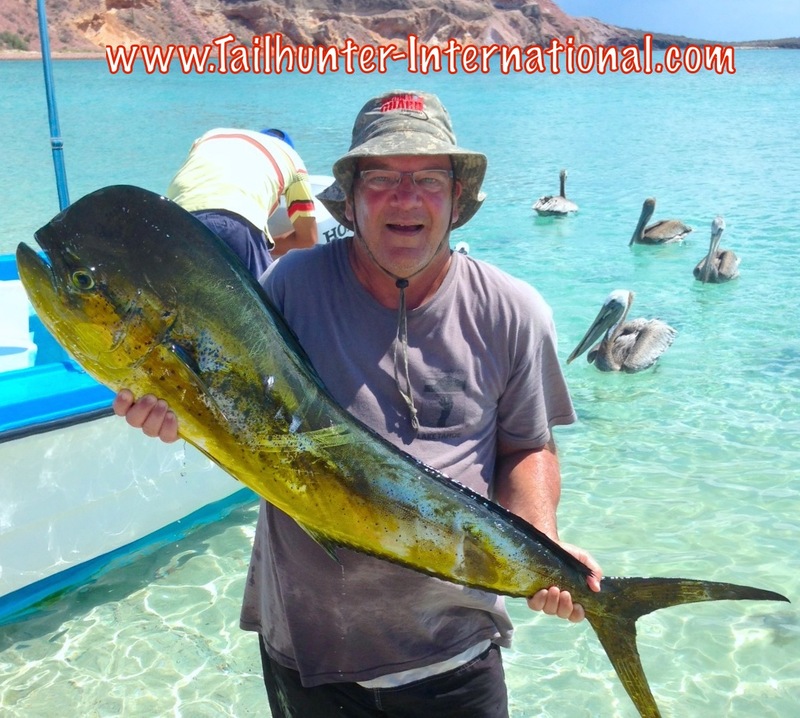 We had clients wanting to spend more time fishing Las Arenas than La Paz. For one, it was a little easier to get bait. In fact, we even had some small sardines by the end of the week. Whether the fishing was a function of the bait, or there were simply more fish in the water, the quantity as well as the quality o fish improved. Sorry, no tuna have shown up…yet! And wahoo fishing hasn’t been so great either the last few weeks. However, there’s quite a few marlin and sailfish around if you want to chase them. Even our flyfishermen got into the fish this week as well! For the past few weeks, if you wanted to fill your ice chest, we had you fishing with our La Paz fleet. More and bigger fish had been the rule rather than the exception. This past week, Las Arenas actually stepped out a little better. It was still good for our La Paz anglers, but it seemed like there were more small fish than normal and not as many. However, if you wanted a shot at a 30-40 pounder, La Paz still gave you the best opportunity at a trophy. The fish are in a wide area. You can seriously find fish right in the bay. In fact, we can see dorado, roosters and jack crevalle breaking just a few hundred yards in front of our Tailhunter Restaurant every day from our 2nd and 3rd floor terraces and birds working the schools like crazy. So, if you honestly didn’t want to go out too far, the bay is definitely holding fish. Other areas are just south of Espirito Santo Island and along the current breaks west and east of the island. Another hot spot that’s actually being shared by both our Las Arenas and our La Paz fleet is just offshore from El Rosario/ Las Cruces/ Punta Gorda north of El Sargento. Some of our largest fish every week come from that drop off area where the shallow water falls off into the trench. If you’re looking for billfish, sails and marlin are being caught right in the middle of schools of small dorado. Presumably, the billfish are in the schools feeding on the smaller fry dorado. Roosters are getting round along the beaches too! Still some hog 40-60 pounders around. 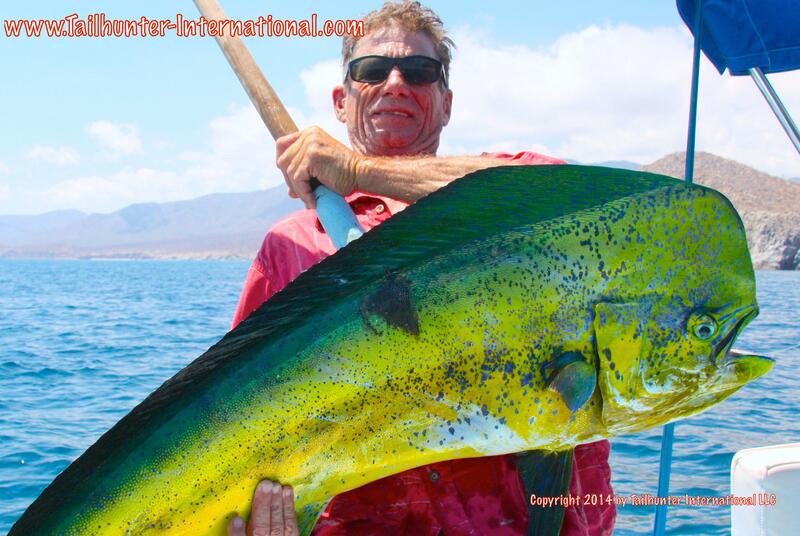 With a big heave…Randy Payne hefts up a solid beast of a bull dorado in front of the Las Cruces area fishing with our Tailhunter La Paz fleet in an area that produce some of the better quality dorado this past week! Brennan Lowery from Los Angeles shows off one of his big bulls he got while posing on the beach at Balandra Bay. He and his dad had an epic day with multiple hookups! She’s a trooper! Kris Brownlee from Rock Springs, Wyoming gets seasick, but that never stops here from always bringing the smiles and getting into the fish no matter how she feels. 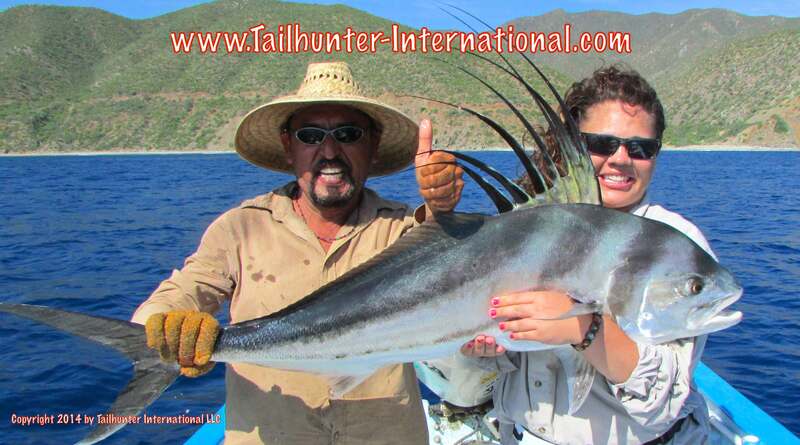 Captain Jorge from our Las Arenas fleet gives her a big thumbs-up for this trophy roosterfish caught just south of Bahia de Los Muertos on a day when all our pangas got into the roosters and ALL OF THEM WERE RELEASED! Congrats to Kris! 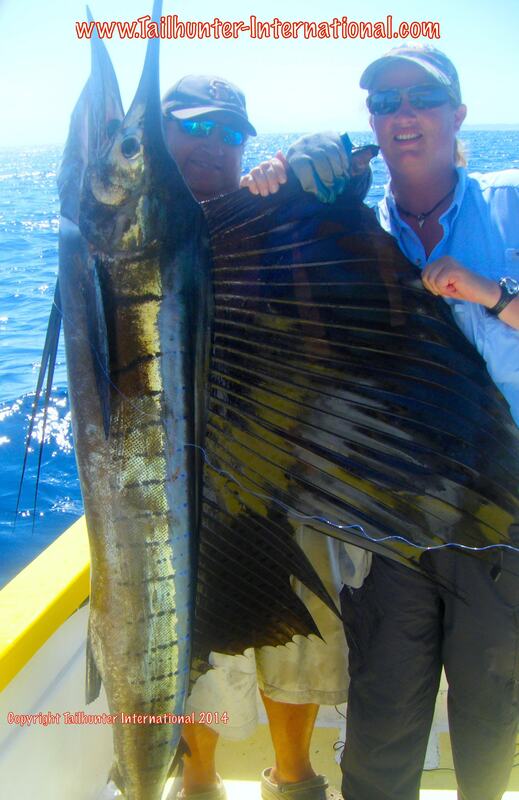 Captain Rogelio “Jolly Roger” gives a hand to first-timer Jessica Reeve visiting us from Wyoming who got this sailfish pretty much right in La Paz Bay! Attempts to release the fish were not successful. The sailfish have been feeding on the small dorado in the bay. He’s got the cool hat and the nice fish! Luke Brownlee from Wyoming fished with us the whole week and our amigo got some nice fish like this as well as roosters and had some shots at billfish as well. Check out the colors on Mike Menasco’s fish! 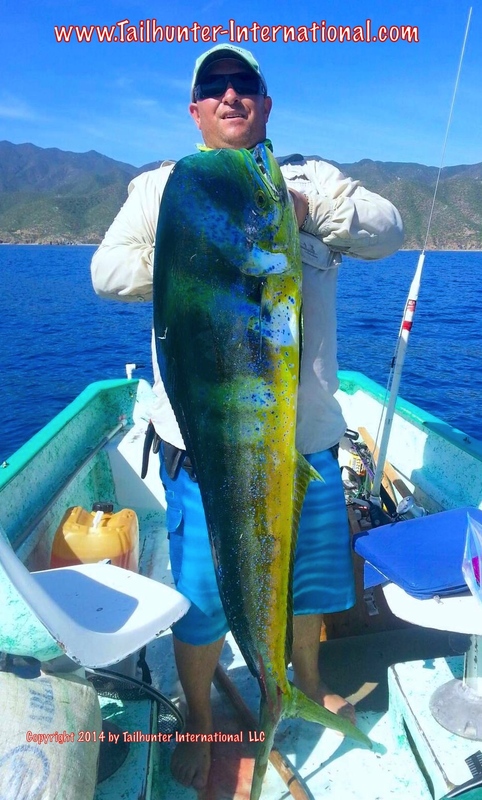 Every now and then we get these gorgeous blue-colored bull dorado. He was fishing just off El Rosario when he nailed this bull. 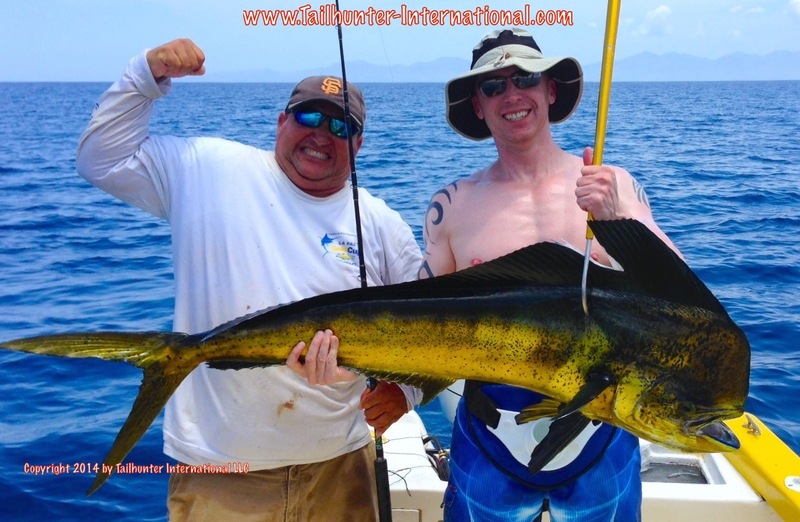 DORADO SHARE STAGE WITH BILLFISH AND ROOSTERS! For once, we had a fairly consistent week of fishing. No big storms. No surprise rainfall. No big winds. It all made a difference even tho’ we did keep an eye on Hurricane Hernan which stayed far away and fortunately didn’t affect us in La Paz. So, we had a good week of fishing overall. Our best performers continued to be the dorado. 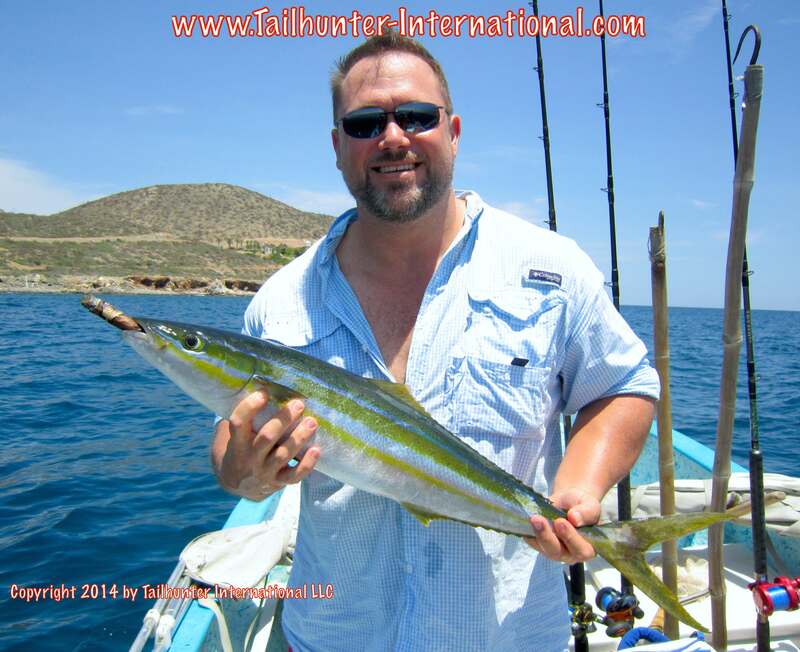 But, we had good showings of roosters, sailfish, marlin and even a few pargo. 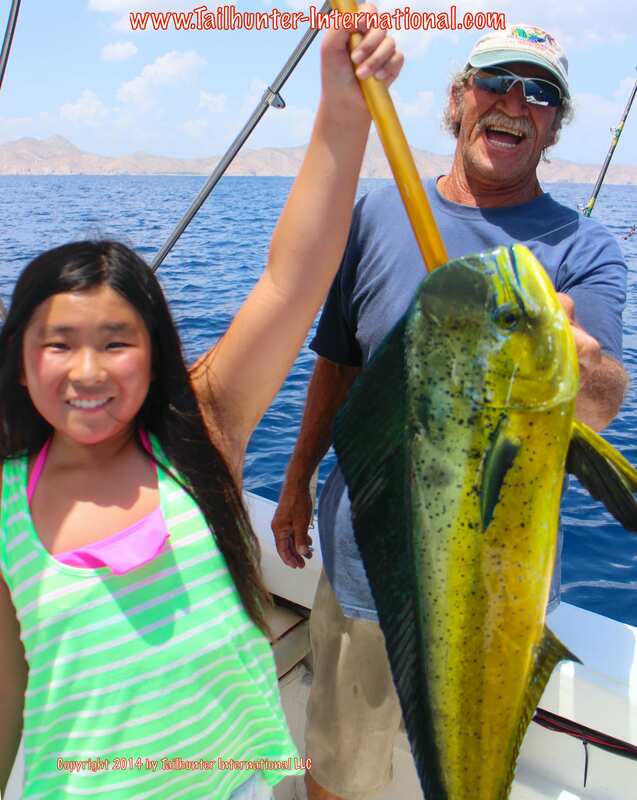 Our anglers who fished Las Arenas ran into more of those school-sized dorado. They sometimes pesky fish are 5-15 pounds with the average being about 8 pounds. Lots of fun on light tackle and surface jigs. Have had several groups of anglers out there with bass rigs and spinning rods having way too much fun. Some larger fish in the 20-25 pound class but not that many. 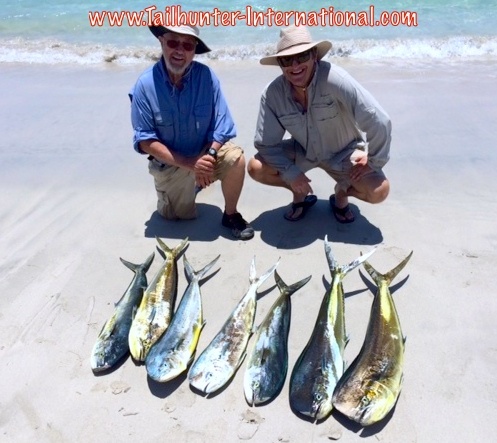 I will say that toward the end of the week, the bite surely improved with not only more fish per panga, but more quality fish as well which was a great surprise as well as some billfish showing. Sorry…no wahoo for awhile and live bait is still an issue, but we’re using a mixture of live bait and dead baits that are all working well. One of the nice surprises this week were the rooster fish. We hadn’t had that many roosters lately either because they’ve moved on or simply we haven’t had that many folks chasing them. They’re exotic and a much sought-after gamefish, but they don’t taste good so if you’re looking for something to put on the plate, it doesn’t make too much sense for many anglers. However, we had a number of folks take a shot at them this week coming back with 20-50 pound fish caught-and-released after nice photos. Our most solid fishing again. Fish can be surprisingly close to shore and literally in the bay. If you’re looking for school-sized fish, one of our anglers said, “We could still see the hotel and Tailhunter Restaurant from where we were fishing all day. Every cast was a biter!” Again, great fun on light tackle and line. 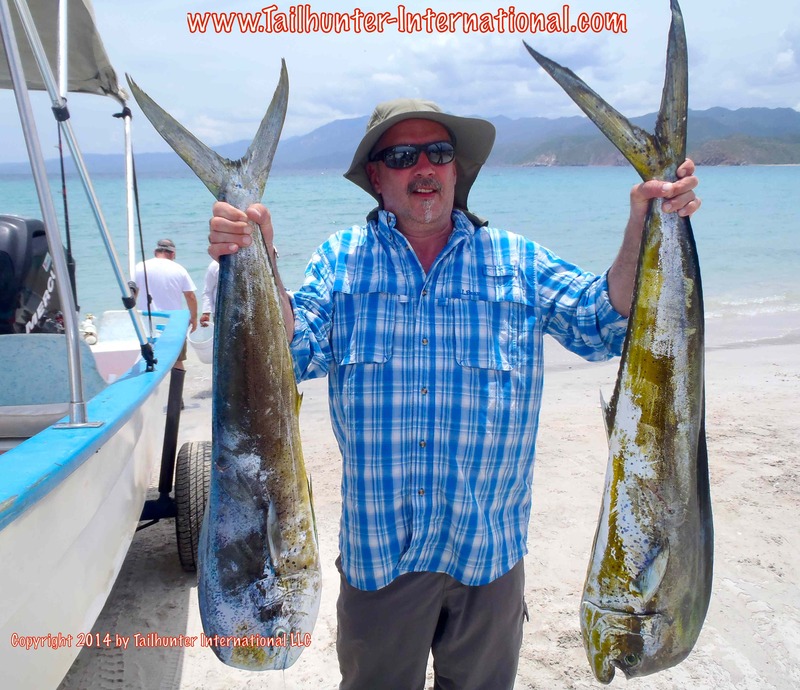 Larger fish were found closer to Espirito Santo Island and around the corner in front of Las Cruces and El Rosario where the fish would be in the 30-40 pound class. As well, schools of jack crevalle would be found that really busted up some happy fishermen and put the hurt on some rods. There are also some good numbers of billfish. A majority of our hook ups on marlin and sails this week occurred right where the small dorado schools were located probably because the billfish are feeding on the smaller dorado.